Developed the Crushers to satisfy the requirements of the higher altitudes for long front excavator to do. Less weight with the same or higher power as with a pulverizer. In addition, the excavator driver can more accurately positioning the scissors in challenging components. Yet here a lot of sensitivity and experience is necessary. If the excavator moves the handle only 1 cm, are at 40m display already fast 4 m. At present the highest demolition excavator can work on 90m. In contrast to crunshers the crushers are provided with a narrow mouth. This means that the higher powers here. Thus, the material quality of the breakable material is very crucial. Using the example here is the force for the same machine size by up to 100% greater. The narrower teeth naturally also weighs a little less. 500 kg are not uncommon here. The maintenance of such a device is, as with all attachments, is extremely important. Of course, the tools are in dirt and mud. The visit also usually very desolate, usually makes the devices but nothing. What you should really pay attention to the daily greasing and debris must be removed. The control of the external and internal hydraulic hoses and connections is recommended. Bolts and nuts should be checked regularly for tightness. 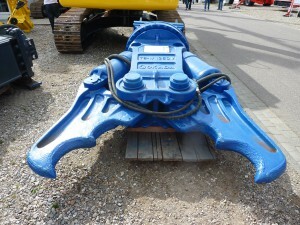 A demolition cutter is often fitted in the rear part with hard metal cutting. In the front area crushing teeth are installed. These scissors are often attached to a long front excavators and used in the high crash. Low weight and high cutting performance is very beneficial especially for this area. 360 ° free rotation are standard here. Furthermore, low dust and low noise characteristics of this tool. The high-carbon steel blades are interchangeable and usually more than once applicable. Again, make sure that replacement of used blades do not be late. If the knife seat must be rebuilt, which can sometimes lead more active stay in a workshop. -> Unnecessary costs. Frequently CombiCutters are also equipped with a removable dental system. Again, make sure that the tooth seat. The resulting costs for reconstruction of a tooth seat bracket are not insignificant. The frequent question on the performance of such pliers is dependent on many factors. Average Performance scissors with approximately 2t. Operating weight are 18 – 26 m³ / h, depending on the quality of the breakable material.. Through technical components to increase the force is achieved by some manufacturers, so-called Booster. Here they develop their own experiences. The Booster is a complex component that belongs in competent hands. A repair is only recommended by a specialist, because this component is really very special. Other manufacturers remain in the system: the same amount of force large cylinder. As the crushers are usually rotatable, it is easy to position the crushers. So you can break even the most difficult parts fit perfectly. By rotation is achieved, moreover, that the crusher is less damaged. 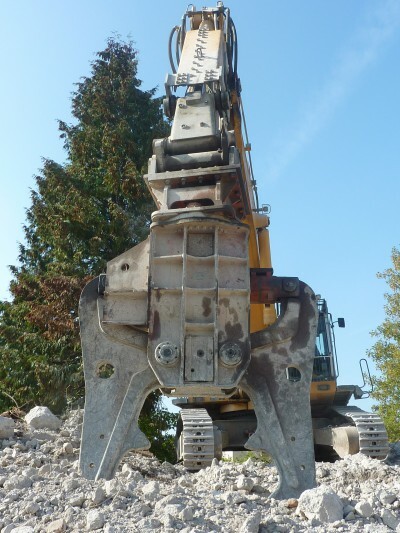 The crusher fits virtually the component and is therefore optimally utilized. Disk Size: 2t – 150t. For proper use with the device we strongly recommend to take the time and read through the instruction manual of the attachment in peace. Before first use or after prolonged downtime, you should use this tool several times in “neutral”. Especially for First-time it always comes back to the so-called diesel effect. This means that the air bubbles are in the oil, in case of sudden use (cold start) are strongly compressed (cavitation). They are heated so much that self-ignition of the air-gas mixture may occur. This mini-explosions are so strong that they can destroy seals. Also, the oil will age faster. You can tell this because the oil is dark quickly, as produced by the combustion of carbon black. Hence the term diesel effect. When operating at idle, the oil is warm, the air bubbles it spread more and are also deposited on the hydraulic pump.